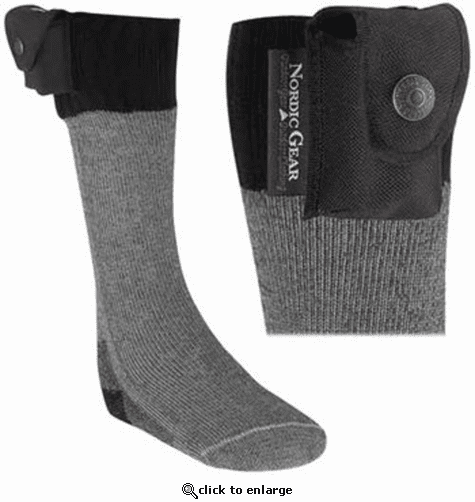 Nordic Gear Battery Heated Lectra Sox feature a unique battery-heated design for hours of maintained warmth. Great for hunting, snow sports, snowmobiling, working outside, motorcycle riding, and even just walking the dog. Battery heated socks make a great gift too! Snap on/off control for easy operation and are designed to be safe even when wet. Recessed channel built into the leg and toe area keep the heating unit flush with the sock. Each sock requires 1 "D" battery which provides 6-8 hours of comfortable warmth. Accessible battery pouch for easy heat control and comfortable cushioning in the sole of the Lectra Sox will make these one of the most favorite socks you own. Made with Hollofill high-tech fiber for maximum moisture wicking. I like the material blend for these socks. The warming part is simply a strip across the toe that gets lightly warm. Not cozy warm like an electric blanket. If you are looking for socks that keep toes warm, but not overly warm,then these seem good, though I haven't tried them in below 0 weather yet. If you are looking for a sock to wear around house because your feet are always cold, then these are not the best choice. As indicated in the advertising, the socks use a D battery in each sock. That size battery is a bit bulky, but there are no annoying wires with these socks. I purchased on sale, otherwise I would have regretted purchase because I was looking for something warmer, without plunking down serious change. I Live in Fairbanks Alaska and would recommend these socks anywhere in a cold environment! -35 outside no problem toasty! I ORDERED THESE SOCKS FOR MY ELDERLY FATHER, HIS FEET AND LEGS ARE ALWAYS COLD. ConsCOULD BE A BIT THICKER.BUT GOOD ANYWAY..
Socks are comfortable and although they do not reach high levels of heat, they certainly took off the edge off of the cold. My husband and I used these socks for 3 days in a row under our rubber boots, but then ran out of batteries. Specifically, each sock requires a D battery which is drained after 3-4 hours. I would recommend the company to include at least 1 set of D batteries because it is unclear that the socks do not come with batteries. When we wore our socks under neoprene waders with rubber boots, while sitting in a duck blind hunting ducks in -2 degree F temps, our feet were chilly. At first I didn't think they really worked but when we wore the usual 2 pairs of wool socks during 18 degree F temps, our feet were FREEZING! to the point of pain. We then realized that these socks were incredibly beneficial but understand that each day you wear them, you will need 2 D batteries.